Teaching children prayers is necessary especially the prayers that we Catholics use most often. One prayer that is over looked is Grace Before Meals, but here are a few activities that might be helpful to learn this prayer. 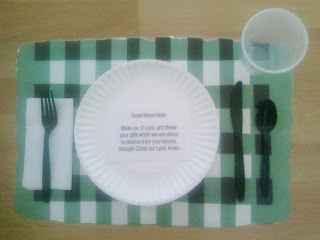 I found a craft from The Big Book of Catholic Customs and Traditions for Children's Faith Formation by Beth Branigan that is so creative and fun that the children will learn this prayer in no time. Grace Before Meals 3-D Picture- Students make a placemat any way they like using a large piece of construction paper 18 X 12”and other craft supplies. Then glue a napkin, silverware, plate, and a plastic cup on it like a place setting. Students then glue the Grace Before Meals prayer on the plate. 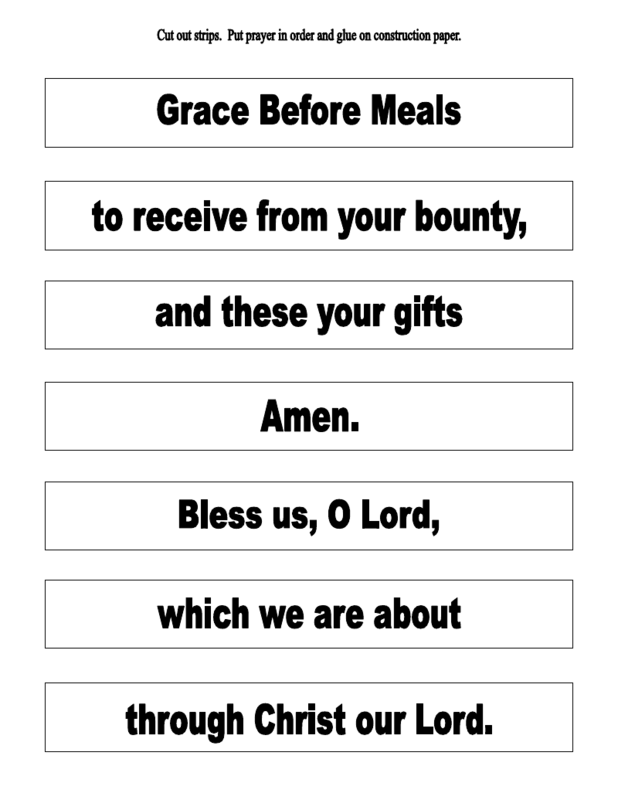 Grace Before Meals Roll a Prayer (worksheet)- Cut out prayer strips. Students roll a die to collect all the pieces to their prayer. The first one to collect all the pieces to the prayer is the winner. 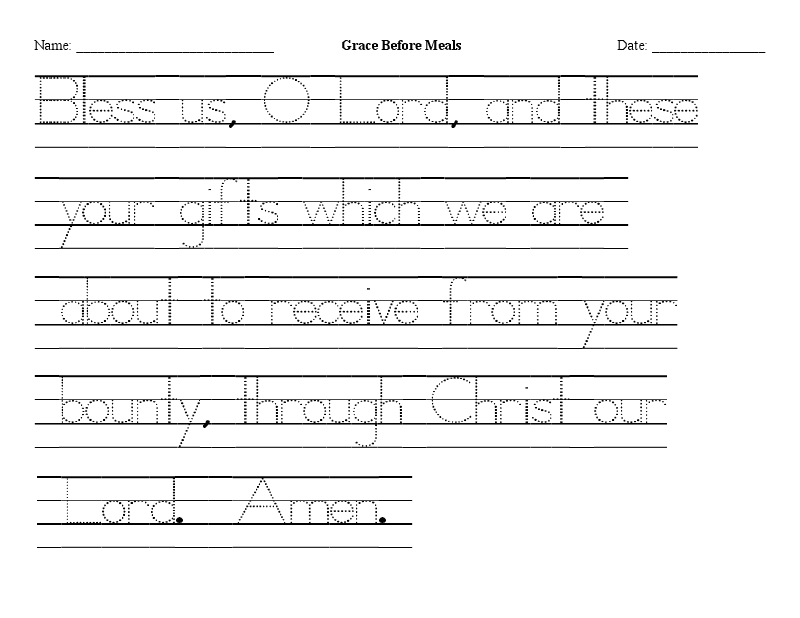 Students then glue in the spaces provided the prayer in the correct order. These activities are free, however they can only to be used for classroom and personal use. They may not be published on any websites or other electronic media, or distributed in newsletters, bulletins, or any other form or sold for profit. 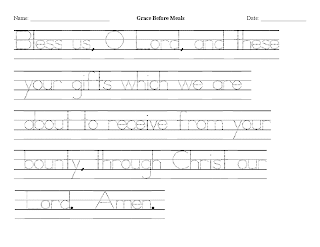 Grace Before Meals Handwriting Sheet (manuscript)- Traditional version: Bless us, O Lord, and these Thy gifts which we are about to receive from Thy bounty through Christ our Lord. Amen. 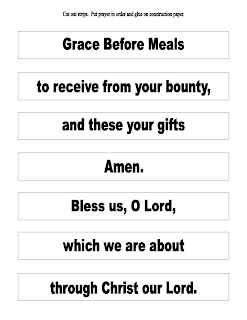 Grace Before Meals (worksheet and/or game)- Traditional version: Bless us, O Lord, and these Thy gifts which we are about to receive from Thy bounty through Christ our Lord. Amen.